I love Chinese food. I’ve never made it at home, though. While shopping at Publix recently, the Apron’s Cooking station was making this beef and broccoli recipe so I stopped for a sample. Immediately I knew this was the recipe I needed to try at home. 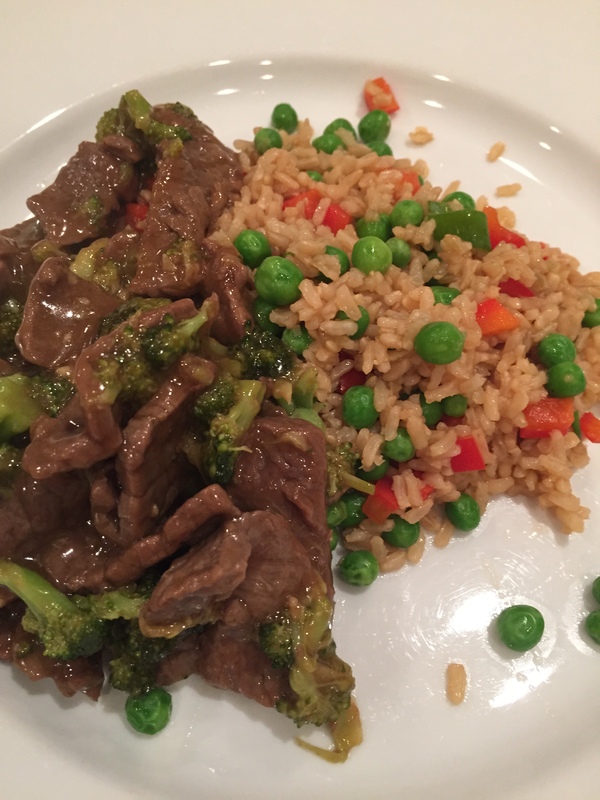 The week 25 recipe in the 52 Week New Recipe Challenge is beef and broccoli with fried rice. It was a hit with the family and a recipe that will definitely go into my rotation. I like to get as much prepared in advance as possible so I can just throw recipes together. I usually purchase a head of broccoli but the bagged florets were on sale so I thought I’d save myself some time. I still had to cut those florets to bite sized pieces. It’s important to note to have everything prepared as this dish comes together quickly. I think my family would agree that this was just as yummy at take out. Cut broccoli into bite-sized pieces. Steam in a small amount of water until crisp tender but not completely cooked. Preheat a large saute pan on medium high heat for 2-3 minutes. Place oil in pan, then add steak, garlic and ginger paste. ; cook and stir 3-4 minutes or until lightly browned. While steak cooks, combine remaining ingredients, except broccoli in a small bowl until well blended. Stir broccoli and sauce mixture into beef. Bring to a boil; cook 2-3 minutes or until sauce thickens and broccoli is tender. Serve with fried rice. In a medium saute pan saute red pepper in butter until soft. Remove from pan and set aside. In a large saute pan combine broth, soy sauce and garlic. Bring to a boil on high. Stir in rice and return to a boil. Reduce heat to low, cover and cook 5 minutes. Remove from heat and stir in peas, green onions and red peppers. Cover and let stand 5-7 minutes or until broth is absorbed. Fluff with fork and serve. For a change, stir in sliced water chestnuts to the beef with the sauce. This entry was posted in 52 Week Challenge, Beef, Comfort Food, Company Worthy, Entrees, Side Dishes, Sunday Dinner and tagged 52 week new recipe challenge, Beef, beef stir fry, broccoli, Chinese at home, Chinese take-out, fried rice, side dish, stir-fry, vegetable side dish, vegetables. Bookmark the permalink. I really really needed this, I spend way too much money on take out! I know, right?! Us too and I’m trying to get better. This recipe was a good start for us. Wow, that sounds pretty quick and easy! I’m not crazy about beef but I’m sure it would be just as nice with chicken and I love broccoli too, delicious combo! Chicken would be a great substitution and I think would work well with the flavors. That looks so, so delicious. Why spend money on takeout when you can make it at home?! Great post! Thanks, Julia. I hope to experiment more soon. Chinese food is definitely my favorite food and I am always looking for good recipes…I’ve never been able to make authentic tasting Chinese food still yet. Excited to try this one out! !